Disasters are difficult on everyone and having treats available when you are stressed and anxious can be comforting. I know you need to have healthy foods in storage, but including a small amount of snack foods that everyone enjoys does not hurt anyone and can be a way to keep things feeling normal. In a previous post, we covered Survival Uses for Junk Food. Today we will look at how we would store these types of food. Keep away from any type of light. Place the bags in an airtight container. If stored properly, solid milk chocolate will last about a year, white chocolate will last around four to six months, and solid dark chocolate will last around two years. Rotate your stocks by eating the oldest one, and replacing with newer supplies. I do not recommend just leaving them in your cupboard, as insects can get in and ruin your chocolate. When I was in high school, I had the unfortunate experience of opening a chocolate bar and finding it was infested with worms. I will never forget that incident and therefore am very careful about eating old chocolate. If you want to store for a few years, you can seal in jars using a vacuum sealer. M&Ms hold up very well. I would say store for three years, then use and replace. Otherwise, the chocolate will inevitably start getting discolored and crumbly. There may also be flavor and texture changes over time. Many people store cocoa long term instead of chocolate candy, so they can make their own treats or hot cocoa. I keep Saltines and Ritz Crackers in the pantry for light snacks. When the package is opened, they only last about a month or so before they start getting stale. However, I have noticed an unopened box can last about eight months to a year, usually a couple of months past the expiration date. After that, the crackers start to taste stale. Looking for a longer lasting alternative, I stored Pilot Crackers using Mylar Bags and oxygen absorbers back in 2010. First, what are Pilot Crackers? Pilot crackers are also known a hardtack. They are long-lasting crackers that are also popular among backpackers, as they don’t easily crumble and can last through a long backpacking trip without spoiling. They taste bland by themselves, but are not bad with peanut butter, jelly or other spreads. I kept them in sealed five gallon buckets up until recently. I opened the package and found the crackers were still in great condition. We ate the crackers and replenished the storage. Or you can now purchase #10 cans of Pilot Crackers by Mountain House. I do have a weakness for chips and other salty snacks like pretzels. When unopened they actually last a couple of months past their expiration date. If you want them to last longer, you’ll need to also repackage them with a vacuum sealer. To avoid crushing them, use a canning jar instead of bags. I’ve stored hard candy such as Lifesavers, lollipops, Nips in their original packaging and they have lasted up to a year before losing quality. If you want to store them for long term, use Mylar bags and oxygen absorbers. Store in sealed five-gallon buckets in a cool dry place and they will stay fresh for years. For detailed instructions on storing and repackaging a variety of foods, see Survival Mom’s post below. Make sure you only store foods that everyone in your household will eat. Since you only have a limited amount of space, you’ll need to be very choosy on the type of foods you store. Use and replace your stash so they don’t go to waste. 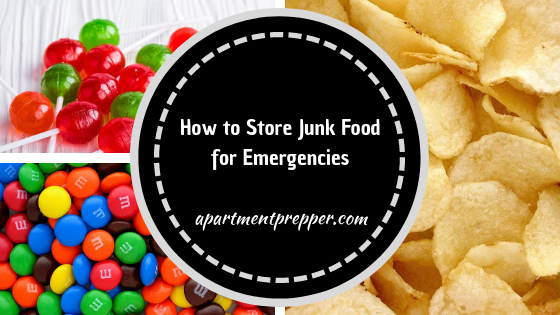 If a disaster hits, you’ll be glad you have a few snacks stored away. I like to buy hard Christmas and Halloween candies when the are on sale after the holidays. I store them in vacuum pack bags and in metal popcorn on Christmas cookie cans. That way the can are vermin proof. I buy the cans at Goodwill stores just check that they are not rusty inside or out. They seem to keep real well and I have opened up some that were over 3 years old. I will start putting in oxygen absorbers next time. I had “Pilot Crackers” for the 1st time back in 1969 at Outward Bound course in Colorado. We would eat them covered in honey and sunflower seeds (that is what was in the food bags we were given). I make my own hardtack crackers using a civil war recipe and vacuum pack the crackers as well. It a bit of work to make but I enjoy the fact that I made it. Hi Oldguy, With Halloween and Christmas right around the corner, it is a great time to stock up on candy sales. I did see a lot of storage tins at Goodwill the last time I was there, I should’ve picked some up for storage. Hmmm honey and sunflower seeds on Pilot Crackers does not sound bad at all. You just gave me a great article idea on making hardtack from scratch. I will need to research and try it out for myself. Thanks for the ideas. I appreciate you reading and commenting on my articles. I am encouraged to keep writing. You will need a dough docking tool. This rolls holes through the dough so it does not rise. You can do this with a nail but that is slow and uneven. I keep the thickness less than 1/4 inch and cut the crackers into 3 x 3 most of the time. Hardtack is very bland and properly done hard as a brick. You will need to keep it dry for long term storage. I bake it at 350 on a dry cookie sheet and turn the crackers one time. I bake them till the tops just turn very light brown. Than flip them over till the other side turn too. You DO NOT want any oil because that will go rancid in time. Use a lot of flour on your hands and cutting board and roller to keep the dough from sticking to them. Have fun! Hi oldguy, Thanks for the additional directions and tips!